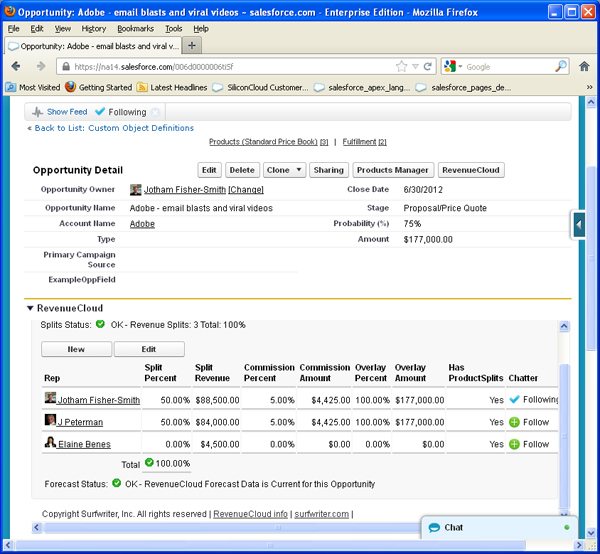 Do you want separate Revenue Splits between Sales Reps on Salesforce Opportunity Products? 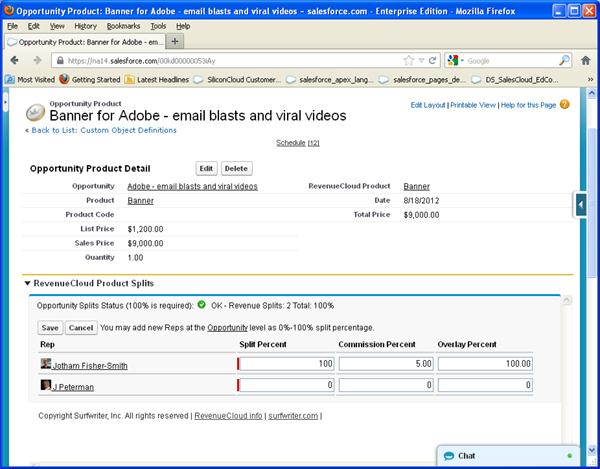 RevenueCloud™ is the first Native Force.com App to enable Opportunity Product Splits in Salesforce! You can see a demo of RevenueCloud Product Splitting at 11:25 of this RevenueCloud Demo Can Salesforce do this without RevenueCloud™? No. How is Product Splitting different from RevenueCloud™ Opportunity Splits? RevenueCloud™ for Salesforce has always split Opportunity Products and Schedules between multiple Sales Reps but previously the splits were all required to be at the Opportunity level and were inherited by all Opportunity Products. Salesforce Opportunity Products can now be easily shared between different Sales Reps using different split percentages within the same Opportunity. Will this add extra clicks for Sales Reps? Opportunity Product Splits are totally optional so there are absolutely no new clicks added by this feature unless a user wants to create a Product Split. Just like RevenueCloud™ Opportunity Splits, Product splits will automatically be applied across any Quantity and / or Revenue Schedules created under the Opportunity Product. How do you install RevenueCloud? Click "Get it Now" to install RevenueCloud™ from the Salesforce App Exchange. How do you set up Product Splitting? As you've come to expect from RevenueCloud™, the Product Splits Interface takes seconds to set up, is intuitive, easy to use and the data will feed right into your existing RevenueCloud™ Reports and Dashboards with no additional changes. 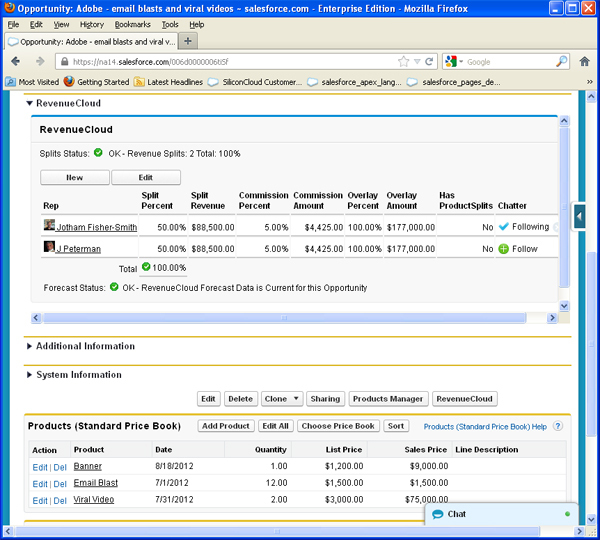 A field on RevenueSplit: "Has Product Splits" in the RevenueCloud™ Opportunity Splits Interface indicates whether Product Splits have been created on any Opportunity Products in the current Opportunity. If no Opportunity Product Splits have been created, then all Opportunity Products and any related Revenue Schedules will continue to be split according to the Opportunity Splits. If Opportunity Product Splits have been created, then they will control the assignment of Revenue to Reps on those specific Opportunity Products and any related Schedules. All other Opportunity Products will continue to inherit their Split Percentages from the Opportunity Splits. A new field: "Split Revenue" displays total value of the current split (taking into account product splits). 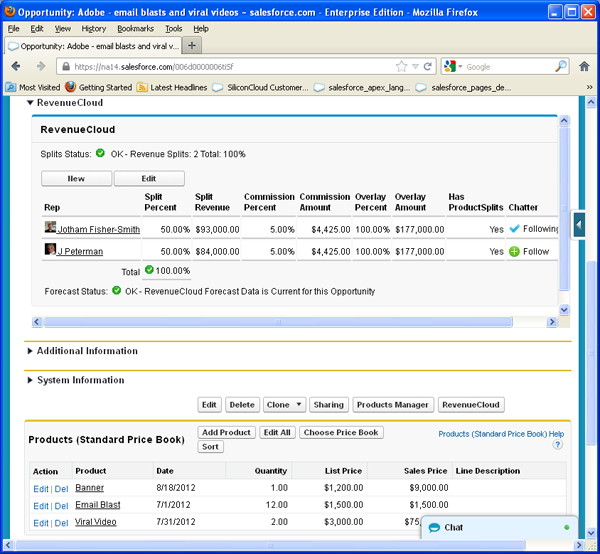 A familiar, user-friendly, RevenueCloud™ interface is now enabled on Opportunity Product. It only takes a few seconds to add the Product Splits Interface. 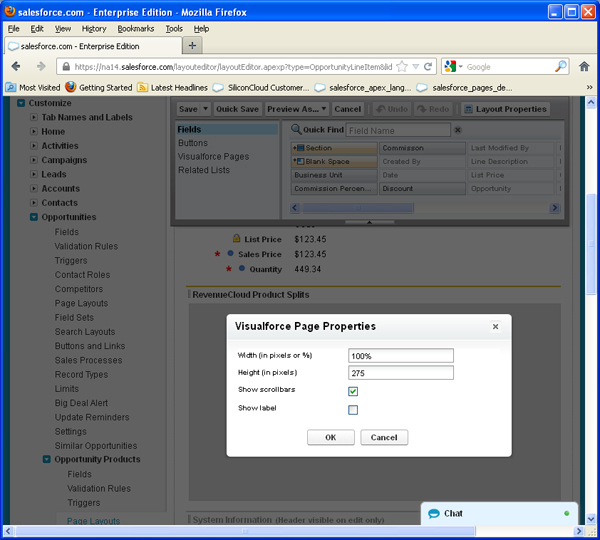 Simply create a new section on the Opportunity Product page layout, drag the Product Splits VisualForce interface onto the page and set the page properties as shown below. 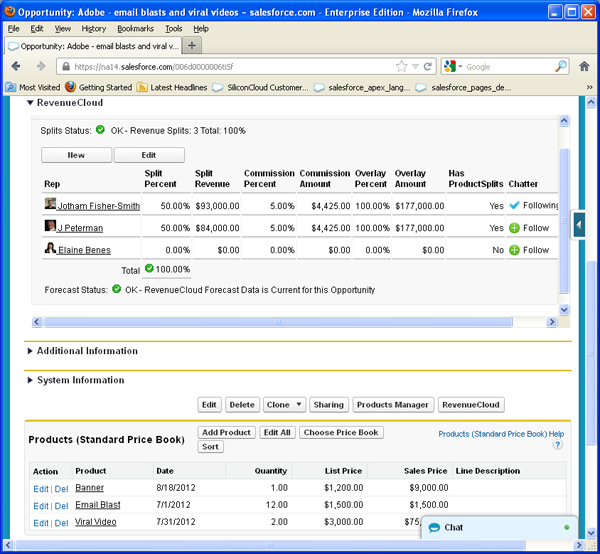 When there are no Product Splits enabled, the interface will display the existing Opportunity Splits and the field: "Split Type" will display "Opportunity". 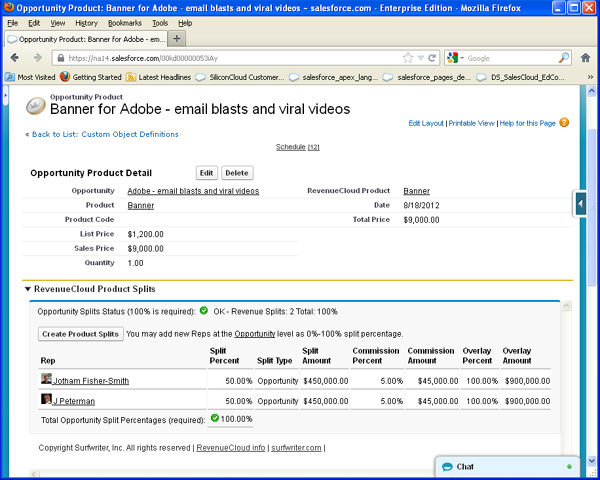 To create Opportunity Product Splits, simply click "Create Product Splits", enter split percentages and click Save. 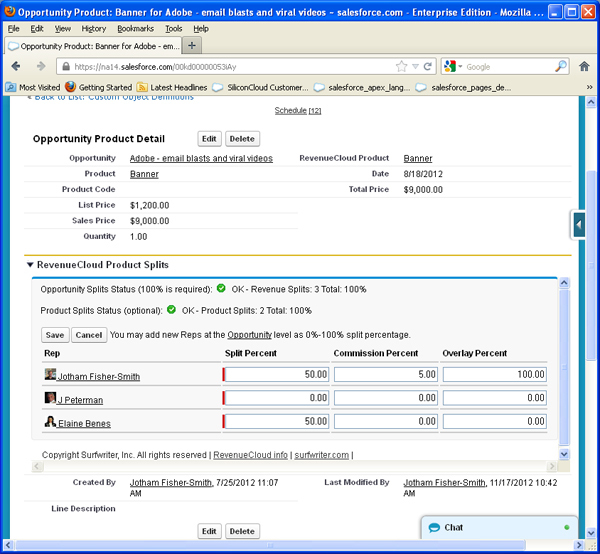 Now the RevenueCloud™ Opportunity Splits Interface field "Has Product Splits" shows that there are Opportunity Product Splits and the "Split Revenue" field displays the new value of Rep's share of the Opportunity with Product Splits taken into account. What if we want to add another Rep to be used only in Product Splits? We can add her at the Opportunity Splits level with 0% Split Percentage as shown below and she will now be available for Product Splits on any Opportunity Product. 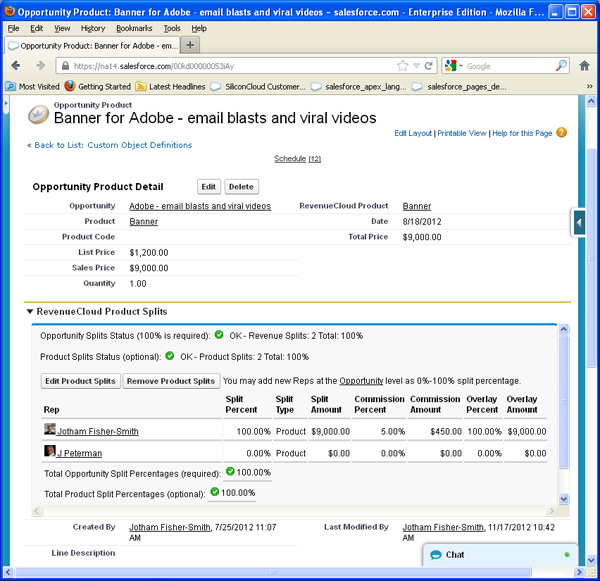 Returning to our Opportunity Product: "Banner", we can adjust percentages to provide a share of this Opportunity Product to our new Rep, Elaine (who we added to Opportunity Splits above with zero percent) and click Save. Now, our new Rep Elaine has been assigned a 50% share of only this Opportunity Product "Banner" on this Opportunity. 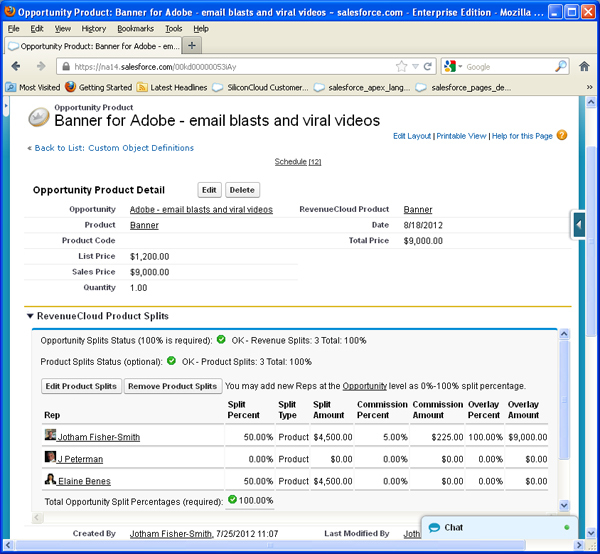 Returning to the RevenueCloud™ Interface on our Opportunity, we can see that though Elaine has a zero percent split of the total Opportunity, her $4,500.00 share of the "Banner" Opportunity Product is displayed. Here's a RevenueCloud™ Matrix report displaying our split Opportunity and Product Scheduled Revenue by Sales Rep and Product. 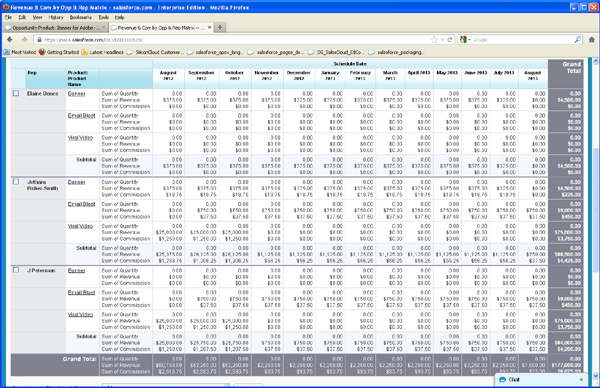 Download RevenueCloud and evaluate free for 30 days from the Salesforce.com AppExchange.